I go through phases, you could even say obsessions with certain things. Sometimes it’s a movie, or a song, maybe it’s a band or a photographer, perhaps an ingredient or a food is grabbing my attention, but there’s always something. For instance, I’ve had a long time love affair with the films of Wes Anderson and roasted red peppers. Recently, I’ve become obsessed with The Devil Wears Prada. I caught it on TV the other night, and let’s just say that I watched it at 9:30 and then again at 12. Yep. Officially obsessed, and I want to watch it again tonight. I feel like my film teachers would shake their heads in disgust if I said that I was obsessed with this movie. And my fellow classmates, I don’t even want to know what they would think. I don’t care though because I love it. The best part is that a couple of months ago I was lucky enough to attend a Q&A session with director David Frankel, and perhaps hearing him talk about the process of making The Devil Wears Prada (among his many other films) just made me fall even more in love with the film. Whatever the reason, I’m obsessed. You can’t deny that Meryl’s delivery of Miranda Priestly is just perfect, how she remembers all those lines and delivers them so quickly and with such a frosty demeanor. Love Meryl. Have I mentioned that before? This salad dressing is packed with flavor. The roasted red pepper adds a nice sweetness and makes the dressing creamy without adding any sour cream or yogurt. I feel like Miranda Priestly would approve of this salad dressing, at least I hope she would! Place all ingredients in a blender or food processor and pulse until combined. 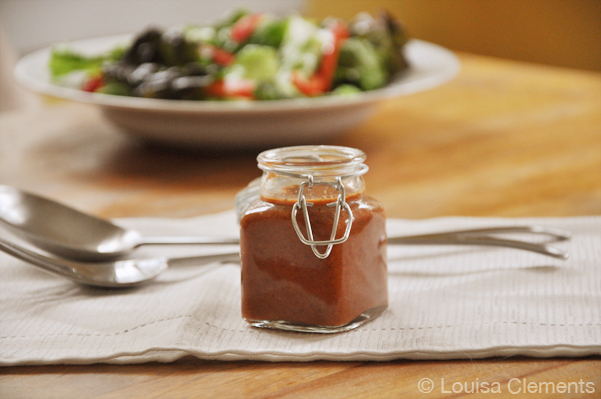 Now that is a delicious salad dressing that is perfect for Meatless Mondays. Do you think Miranda Priestly would approve? I will definitely be making this recipe...It sounds soooo "delish"! I guess we all have our own little obsessions, and it makes us who we are, doesn't it? :) But the dressing sounds absolutely amazing! I'm gonna be obsessed with it, that's for sure! Thank you Fiorino, much appreciated! I hope you enjoyed.